Image caption The council believes the hotel's decision to house more asylum seekers could amount to a "material change of use"
A hotel could be breaking planning laws by increasing the number of asylum seekers staying there, Manchester city council has said. Britannia Airport Hotel - near Manchester Airport - has agreed with the Home Office sub-contractor Serco to accommodate about 300 people. The council said failing to notify the authority of "a change of use" was "completely unacceptable". Britannia Hotel Group is yet to comment. The Home Office would not confirm how many asylum seekers were staying at the hotel in Northenden but Mike Kane, MP for Wythenshawe and Sale East, said 300 asylum seekers were being housed there. Councillor Paul Andrews, executive member for health and wellbeing in Manchester, said: "We do not believe hotels are the appropriate place for asylum seekers to be placed. "We believe there may be a change of nature at the Britannia Airport hotel- a change from hotel to hostel. I have asked planning officers to look at what is going on. "We have also made it clear to Serco that failing to notify the council in advance of this action having been taken is completely unacceptable." Manchester City Council has had no direct responsibility for providing accommodation and support to asylum seekers living within communities since 2012, Councillor Andrews added. The Home Affairs Committee recently warned there was an "impending shortage" of housing for asylum seekers in the UK, including in Manchester and Rochdale. 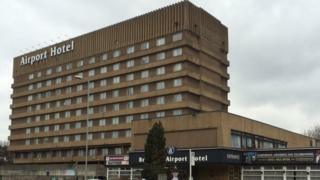 Serco said several hotels, including the 212-room Britannia Airport Hotel, were being used to accommodate asylum seekers. Jenni Halliday, from Serco said: "The availability of individual hotels changes, sometimes at very short notice and when that happens we work hard to make sure that we can make alternative arrangements to safely accommodate the asylum seekers and keep the local authorities informed." I spoke to a small group of the asylum seekers staying at the Britannia Hotel. Two were from Syria and two others were from Iraq. They did not speak English that well but they did manage to tell me they were hoping to claim asylum here in the UK. I had been at the hotel for about five minutes and a woman came over who told me she was from the Home Office and she demanded to know what I was doing there. I explained I wanted to speak to the asylum seekers about what life was like back in their home countries, how they had made the journey to the UK and how they were being treated now they were living in Manchester. The woman told me that even though I was in a public place I could not speak to any of the asylum seekers and if I wanted to speak to refugees I should go to Calais instead. She was being fairly aggressive at this point so I left and the asylum seekers were ushered into the hotel. MP Mike Kane said some constituents had expressed concern about pressure on local services. He said: "There is no statutory underpinning from government or Serco to inform the local authority or local MP about this and these things become subject to rumour and conjecture; but as we found out in this case the rumour was accurate." One local resident said: "It must be an immense cost. A friend of mine comes over from Ireland on a regular basis and has the same room [in the hotel] and it has gone up in price as there are fewer rooms available." A woman added: "I think it is a good thing and diversity is always a good thing and if you can help somebody else who is less well off than you, you should do it. A lot of poorer countries have been taking in people and our country has a duty to help anyone else." A local man added: "I feel sorry for them and all that but they should go to the first country they come to. They have come through about five countries to come here." The Home Office said the UK had a proud history of granting asylum to those who needed it. A spokesperson added: "We have made clear to our providers that the use of hotels is only ever acceptable as a short-term contingency measure." Where do asylum seekers live?